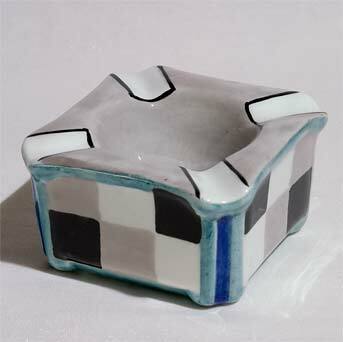 Bough ashtray - 3¼" (82 mm) square, 1⅞" (47 mm) high. Elizabeth Amour (pronounced to rhyme with 'claymore') was a Glasgow Girl - she attended the Glasgow School of Art from 1908 to 1912. After that she settled in Edinburgh and set up Bough Pottery, which continued until 1942. Like Jessie M King, she bought blanks from various sources which were decorated by herself and other members of her family and then glazed. The pieces were initialled by the individual decorator and the word 'Bough' was added. RA, for instance, indicates Elizabeth's brother, Richard, who lived from 1900 to 1949. The last member of the family to continue this work was Christine Amour (Chrissie), who went on decorating pots possibly as late as the 1970s, but not under the name of Bough Pottery. She died in 1974.